Parma has the look of prosperity. 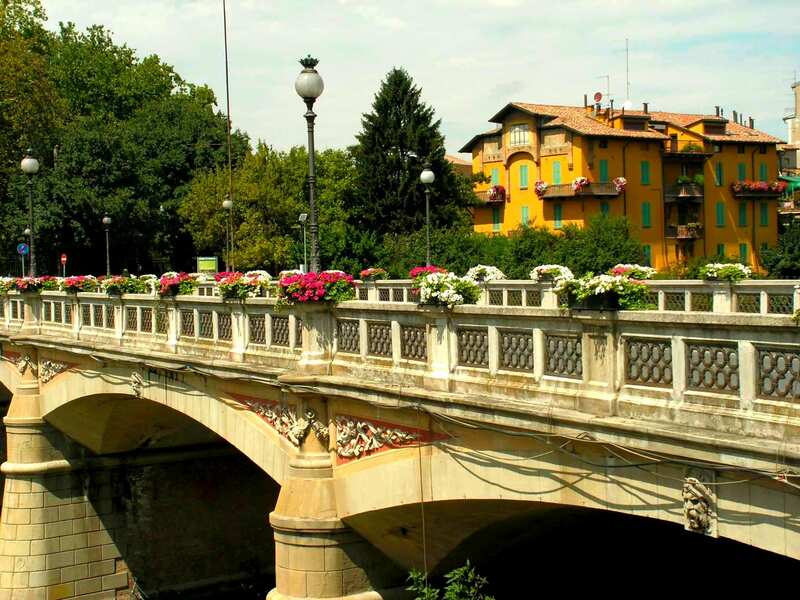 Parma is more or less halfway between Florence and Milano, and the drive via the A1 autostrada is a little over two hours, but the road through the mountains from Pistoia to Sasso Marchoni affords an opportunity for a more leisurely drive and scenic stop-offs. The gas station just beyond Pistoia has the look of the last one for a few hours, and the mountains are no place to run out of fuel. 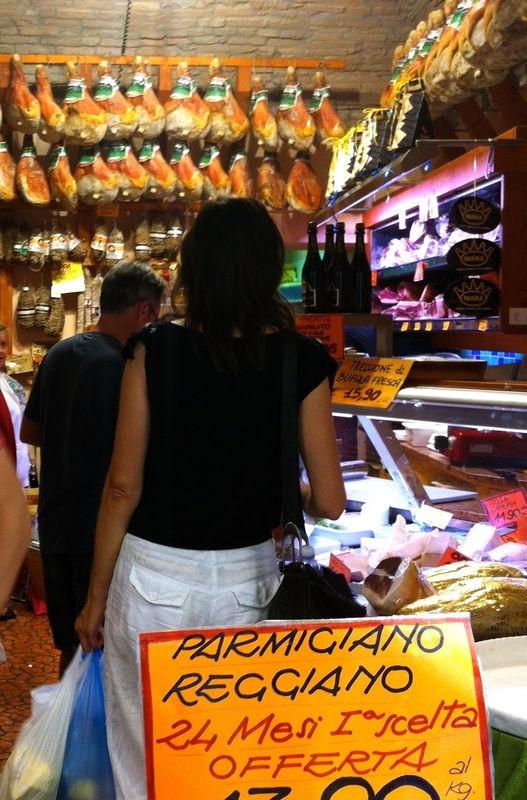 A grocery dedicate to Parma’s favorites. Incredibly (anywhere but Italy), the little mom-and-pop establishment has an espresso machine inside and the cashier brews up a world-class cappuccino while the attendant fills ‘er up. The back road experience is well worth the hour or so that it adds to the trip. Parma’s signature ham and cheese in a local grocery. The road winds through the mountains past picturesque villages, and lake-and-valley views are beautiful. About halfway into the mountains, the highway crosses from Tuscany back into Emilia-Romagna, a reminder that Parma, like Bologna – is another Italian town with a great culinary tradition. 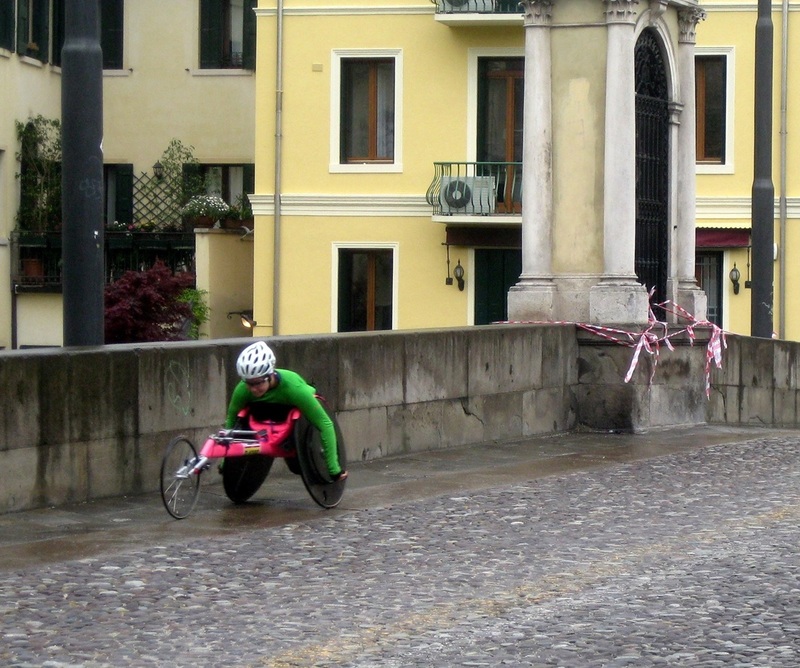 Disability is no obstacle for this cyclist in Parma, Italy. The production techniques for both nurture these products with all of the care of fine wine-making. This hard, pale yellow cheese less often eaten by itself than it is grated and used as a condiment for pastas, salads, and pizza. In the U.S., the name “parmesan” is used for any cheese inspired by Parmigiano-Reggiano. 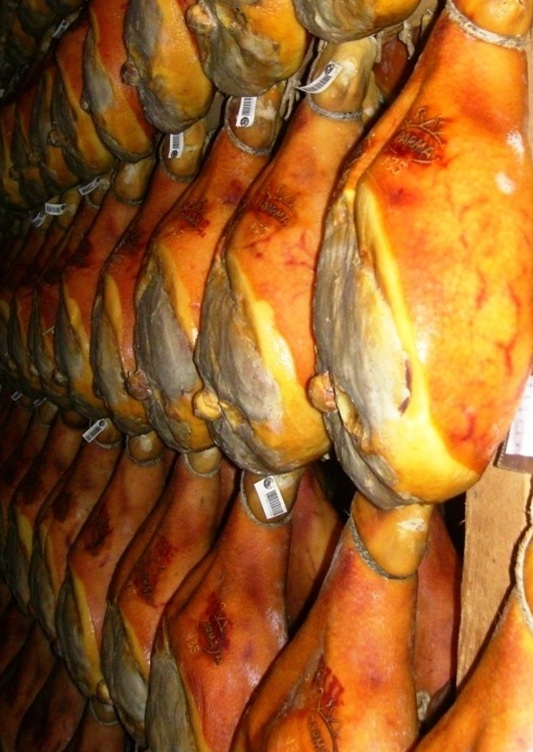 Prosciutto hams curing in Parma, Italy. Within the European Union, the term is origin-controlled and may only be used to refer to authentic Parmigiano-Reggiano. Prosciutto is an uncooked, dry-cured ham – a prosciutto crudo – that’s usually served thinly sliced. Each ham is cleaned and salted, then is gradually pressed over a period of weeks until the meat is thoroughly dry. 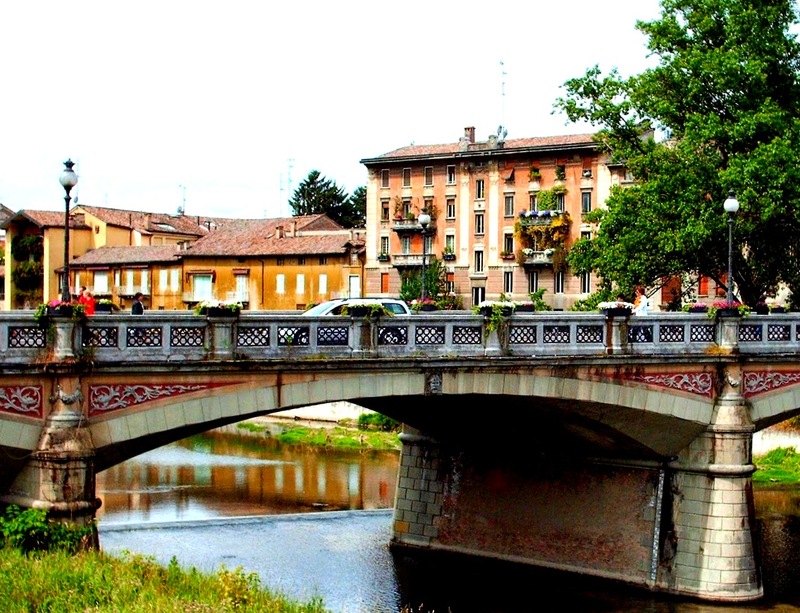 Bridge over the Torrente Parma, Italy. It is then washed to remove the salt and hung in a dark, well-ventilated environment. When the ham is completely dry, it is hung to air to further cure for up to eighteen months. Cold climates yield the best results, and in the days before refrigeration, prosciutto was customarily cured in winter. 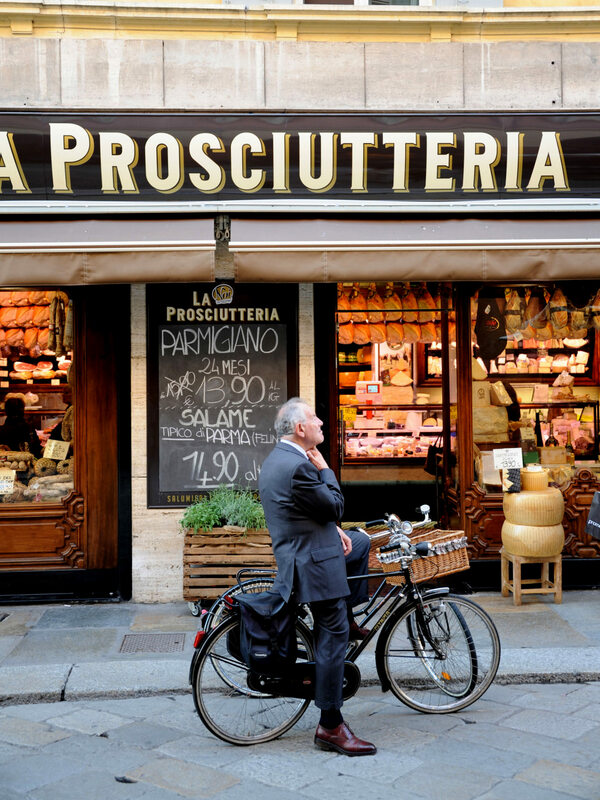 Food specialties like these have made Parma into one of Italy’s most prosperous cities, and its well-kept streets look the part. Palazzo del Governatore, Piazza Giuseppe Garibaldi, Parma, Italy. There is easily a day’s worth of sites to see here for anyone passing through at a more leisurely pace. The Teatro Farnese is a four-hundred year old theater that has been restored following damage by Allied bombing during World War II. The University of Parma maintains a botanical garden here, and the birthplace of favorite son Arturo Toscanini is now a museum commemorating his life and achievements. The main cathedral and its signature hexagonal-shaped bapistry are also worth a visit, but in truth Italy has so many cathedrals, baptistries, basilicas, and convents that the visitor soon learns to reserve time only for the most unique or historically significant. 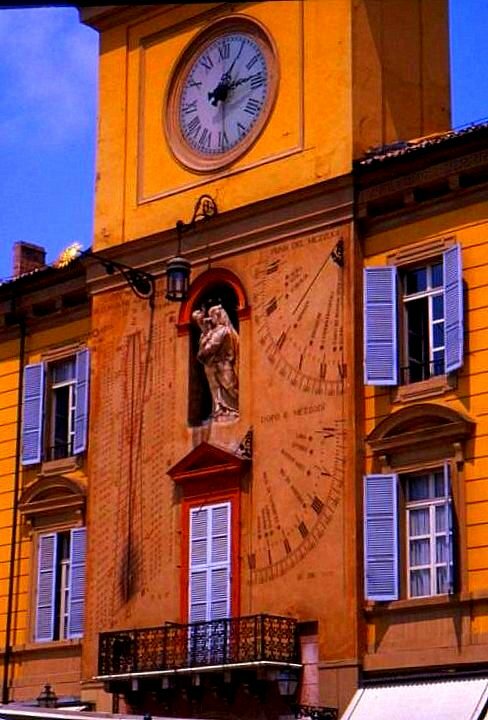 Astronomical clock, Palazzo del Governatore, Parma, Italy. There are also several hot spring spas within half an hour’s drive. 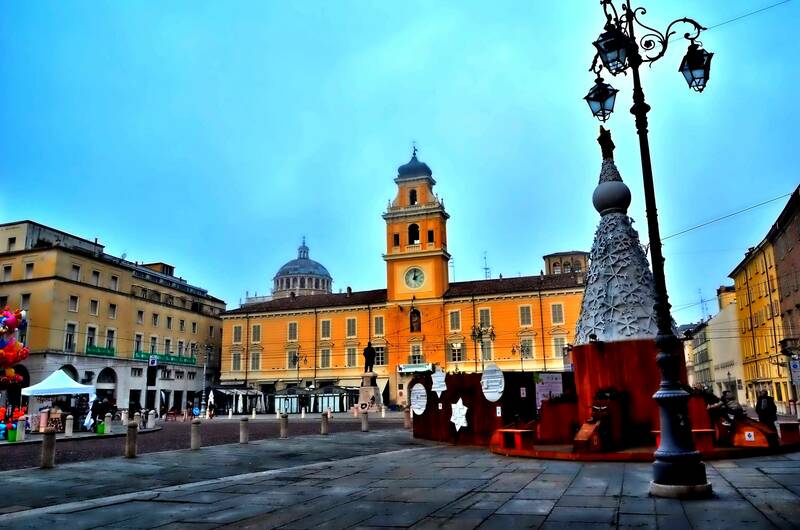 This Parma stopover, though, is limited to a long lunch hour, and after a walk through the city streets of the city center, the place which suggests itself is an outdoor cafe on the Piazza Giuseppi Garibaldi in front of the Palazzo del Governatore. Its astronomical clock is claimed to be the world’ largest, and dates from the late 1500’s. 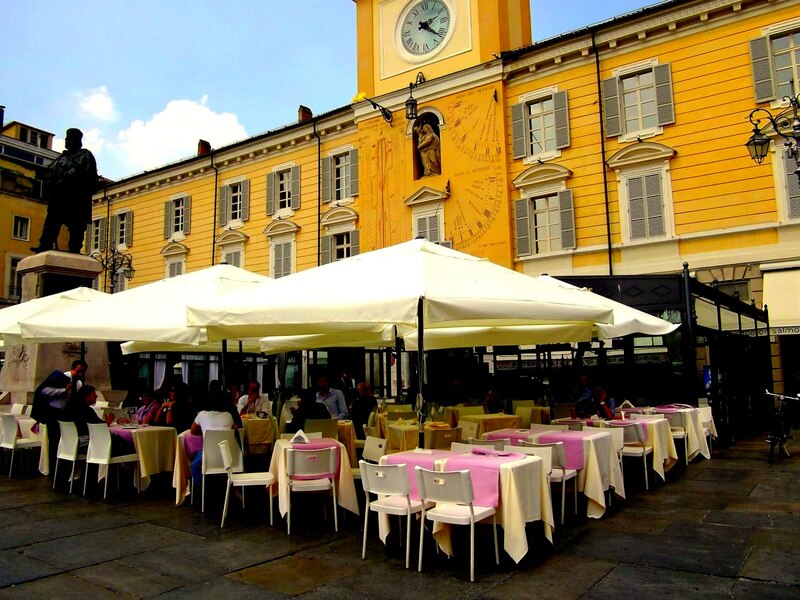 Lunch on the piazza, Parma, Italy. As in Bergamo and Ferrara, a mid-day stopover in Parma has proven to be yet another pleasantly impromptu surprise. Now it’s on to Milano and the last two days of 10 Days In Italy.